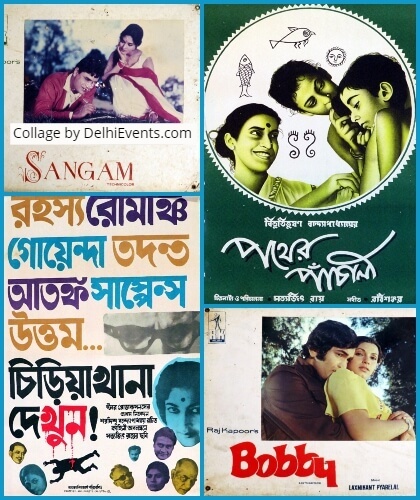 Event Description : ART EXHIBITION "Maestros of Motion Media" show of movie posters, lobby cards and film stills by Indian film makers: Satyajit Ray, Mrinal Sen and Raj Kapoor. The exhibition will showcase a selected collection of movie posters, lobby cards and film stills from the oeuvre of three of the finest Indian film makers: Satyajit Ray, Mrinal Sen and Raj Kapoor. Satyajit Ray, the master storyteller, has left a cinematic heritage that belongs as much to India as to the world. His films demonstrate remarkable humanism, elaborate observation and subtle handling of characters and situations. His first film Pather Panchali (Song of the little road, 1955) established his reputation as a major film director, winning numerous awards including Best Human Document, Cannes, 1956 and Best Film, Vancouver, 1958. It is the first film of a trilogy – The Apu Trilogy - a three-part tale of a boy's life from birth through manhood. His later films include Jalsha Ghar (The Music Room, 1958), Devi (The Goddess, 1960), Teen Kanya (Three Daughters, 1961), Kanchenjungha (Kanchanjungha, 1962), Abhijan (The Expedition, 1962), Mahanagar (The Big City, 1963), Nayak (The Hero, 1966), Ganashatru (An Enemy Of The People, 1989) and Shakha Prashakha (Branches Of The Tree, 1991). Agantuk (The Stranger, 1991) was his last film. Ray, in many senses was truly unique. He most often designed his own sets and costumes, created the frames and storyboards on his own, operated the camera (since Charulata, 1964), single handedly composed the music for all his films since 1961, and even designed the publicity posters for his new releases. Satyajit Ray received numerous awards, both for personal achievements as a filmmaker and for the films he made. In 1978, the organizing committee of the Berlin Film Festival ranked Satyajit Ray as one of the three all-time best directors. In 1992, actress Audrey Hepburn presented an Honorary Oscar to Satyajit Ray, in recognition of his rare mastery of the art of motion pictures, and of his profound humanitarian outlook, which has had an indelible influence on filmmakers and audiences throughout the world, at the 64th Academy Awards in 1992. Sharing a similar wavelength for the art of storytelling, Mrinal Sen worked as a journalist, a medicine salesman, and a film sound technician. His interest in both filmmaking and Marxist philosophy stemmed from his association with the Indian People’s Theatre Association in the 1940s. His first film, Raat Bhore (The Dawn, 1956), met with little success. Baishey Sravana (The Wedding Day, 1960) and Punascha (Over Again, 1961), both dealing with marital relationships, reflected Sen’s political passion. Regarded by many as Sen’s greatest film, Bhuvan Shome (Mr. Shome, 1969) starred renowned Indian actor Utpal Dutt as a lonely bureaucrat who encounters the wife of a ticket collector accused of taking bribes. The film’s use of improvisation and sardonic humour and its naturalistic depiction of rural India established it as a landmark of Indian cinema. The exhibition will feature stills, posters and lobby cards from films like Apur Sansar, Agantuk, Jalsha Ghar, Chidiyakhana and more by Ray; Bhuvan Shome by Sen; and Aag, Barsat, Shree 420, Diwana and more by Kapoor. This is an ongoing project of MATI’s initiation into multimedia research documentation. The show will be inaugurated by eminent film critic, author, documentary filmmaker and painter .